Morning glories and “morning glories”! Late to the market this morning–parking at just before nine. After a hectic five day weekend in London, it’s taking time to get back in touch. The autumnal equinox today (Meredith and friends dance it in tonight) and the tomatoes on the stalls have a farewell look about them. I find myself passing on the green beans and looking for broccoli. I remember Nina–the Dutch-American we bought our house from–saying you have to be in the market by 9am on a Saturday–or the good stuff is gone. I’m usually on my way home by 9am–feeling virtuous and looking forward to breakfast. 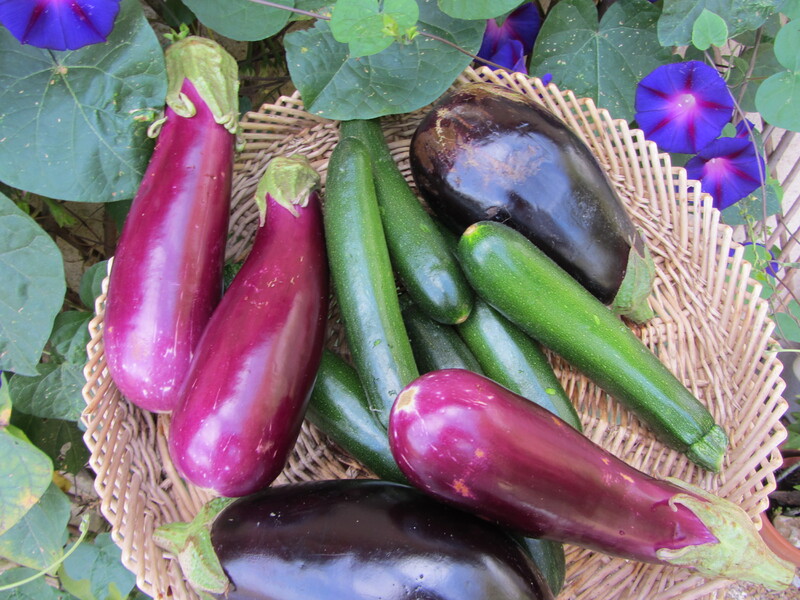 There’s still plenty of good stuff though—rocket, parsley, strawberries, thin aubergines/eggplants, shiny firm courgettes/zucchini, poultry reared locally and fresh sardines for lunch–things that just aren’t the same in supermarkets. And by 9.45 am more of a crowd too. Place Jean Jaures, the large central square in Castres, is filling up. I’m dodging round small groups of friends standing between the rows of stalls, exchanging family news and plans for le weekend. Get there an hour earlier and these social shoppers are still at the breakfast table. I’m idling this morning, taking time and enjoying it. Different town, new season–embracing the changes. Dear Robin, Good your all safe back in La Douce France.Nice veggie colors and the fish looks very fresh.Give my regards also to Meredith & the cats. I would “kill” for fresh sardines. Having spent every winter since 1970 in the south of Portugal, I can re- call the glorious taste of sardinhas asadas straight from the hibachi and onto my thick slice of pao caseira,the most fabulous crusty loaf. Ooooh. Hibachi is a small Japanese style grill with an adjustable rack. I loved my hibachis when I had only a tiny outdoor space, but they are not so common here any more. Happy Autumnal equinox. Feels great after a brutally hot summer in the Washington DC area. Hard to grow anything but basil when the temps hit 100F+ day after day. Hello Deborah–thanks–I was wondering if I’d ever post again! Happy Autumn, Robin and Meredith! 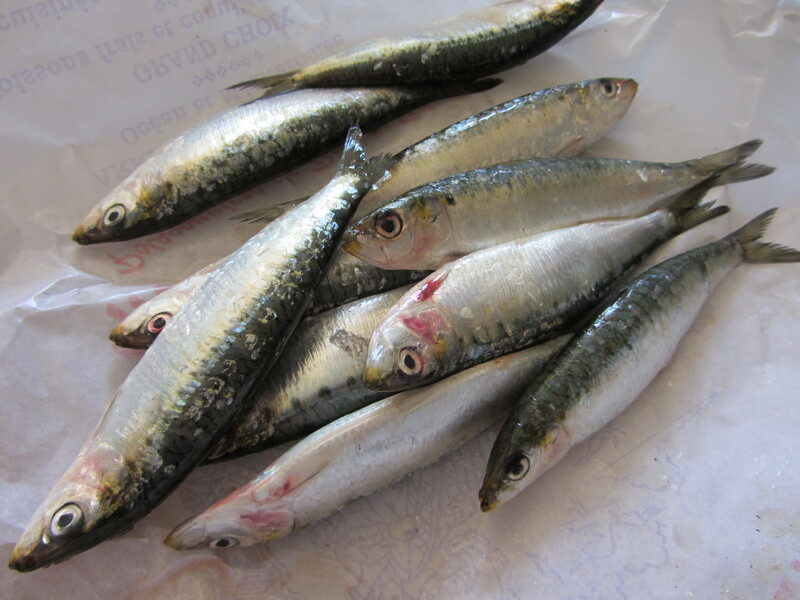 When you say “fresh” sardines, any idea where they come from and how fresh is fresh? The ocean is not exactly next door to Castres, so I’m wondering about the sea food supply chain, how they would get from either the Atlantic or the Mediterreanean to Castres, how long that journey takes, etc. Just curious! I hope you are enjoying the early autumn light. Here in San Francisco, we are just beginning to enjoy that golden light that gave our beautiful state its nickname. These little numbers were from the Med. There were bigger ones from the Atlantic. I asked which were the best. 10 cost 2 euros and they were really prime.It’s only a couple of hours to the Med from us. Happy Autumn to you too, Steven. Our Farmer’s Market will be closed soon till next spring… It saddens me. Nothing like fresh veggies and fruits ….loved seeing our friends on Saturday mornings with a leisurely pace after the hustle and bustle of the work week. OH and …..my sweet dear tomatoes … I shall miss them the most. Why does the market close? Don’t they grow different stuff? Good questions. Supposedly, they don’t find it worth it. During the winter months, I sign up to receive a box from an organic farm ever other week. it’s a surprise … so you never know what you might receive. When I moved from Connecticut to Northern California .. I thought for sure I would be in for a treat of delicious produce. Connecticut was actually so much better! However .. I don’t miss the snow! In New York City we have suddenly gone from hot and humid days to a real feeling of fall, with the trees even beginning to turn a little. I love reading your posts, we are cat people also, and when we lived in Los Angeles, we were gardeners too…now we just go to the Farmers Markets in the city, which are wonderful. Have a lovely autumn! on September 22, 2012 at 11:37 pm | Reply Dianne P.
Welcome back, the two of you! It was a quiet week (on the computer anyway) while you were away. Sounds like the play was awesome! Robin, hope you remembered to show off your new hat at the market…? Do show us! Meredith writing: Hey Dianne, we did indeed dance last night in the garden! Still warm here. We even managed dinner on the terrace afterwards with the dancers. Hope you and Gene are well. I imagine the New Hampshire autumn is a bit cooler than here…. I don’t think I’ve ever had a fresh sardine, unless they are similar to the smelt we have in the Great Lakes (may Meredith would know?). Missed your blog while you were away, but glad you had a nice holiday. Even when you live in such an idyllic spot as you do, a change of scene is always nice, Any plans to come back across the big pond anytime soon? And, bon chance with the cooking class — I know you will be fabulous! Trying to embrace Autumn,but people keep mentioning the ‘C’ word. :-((.Only 90 something days to go!!!! Great that you are both back – your blog is a great delight bringing a fresh pleasure to the wet and windy west of Scotland – no news or photos of cats for a while?